Photographed at Eldoret, Kenya. January 2012. The wings are extended revealing black primary feathers. With hot tropical sunshine this could be a behavior to increase body temperature. 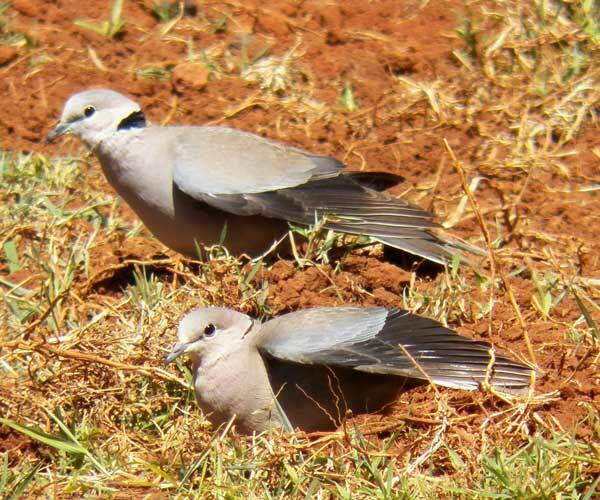 Ring-necked Doves are common in much of Kenya and are therefore very familiar birds around farms, pastures and parks. From Wikipedia: The Ring-necked Dove (Streptopelia capicola), also known as the Cape Turtle Dove and the Half-Collared Dove, is a widespread and abundant bird in the bush, savannah, farmlands, and woodlands of southern and eastern Africa. Their name comes from a black patch of feathers on the back of their necks. The rest of their feathers are a pale brownish-grey, with darker colors on their backs. They also have white tips on the end of their tail feathers.